Portable Air Conditioners are beautiful inventions that provide you an easy access to take it to wherever you want and enjoy the cool atmosphere. Nights of summer brings discomfort due to hot temperature. If you want to get rid of a sweat-filled summer, then the fastest best solution is to buy a portable air conditioner. You can place it in your home, office, shops as it doesn’t need permanent installation. Here you will get to understand so many things about portable air conditioners available and get to read all about the beauty and woes of various types of portable air conditioners that will, definitely save you time and energy in identifying “the best portable air conditioner” and am sure you will know what suit you best after going through this article. 1 When Do I Need a Portable Air Conditioner? When Do I Need a Portable Air Conditioner? A portable air conditioner is needed most time because of the architectural structure and design of the house but in so many ways we will agree that the window air conditioning unit in so many different ways is a heavy hunk of metal hanging precariously over something degrading the beauty of an architectural design of a building and always blasting cool air just from one direction only. 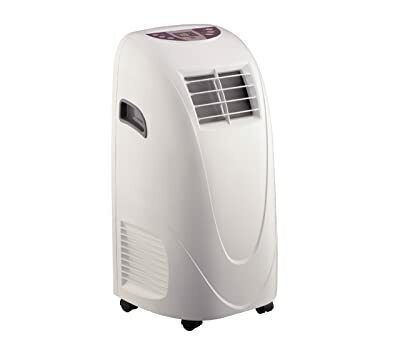 The main architectural importance that made the portable air conditioner needed is the fact that the window air conditioning unit takes over your precious window and depending on the design of the window, you might not be able to open it not until you take it out in the autumn and if you room is a one window room, then I will suggest you really need a portable air conditioner. If you are a tenant, you will agree with me that not all landlords would allow the installation of heavy and chunky appliances like a permanent air conditioner which could be tedious to install, time-consuming and quite worrisome for those who move around a lot. 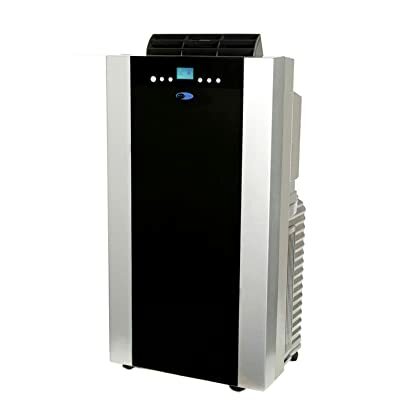 Moreover, tenants are known to be the largest set of people who needs portable air conditioners. As for office workers, it is well known that the productivity ratio of an office worker and appliances can be affected by high temperature as it reduces the level of production, creativity, and concentration. 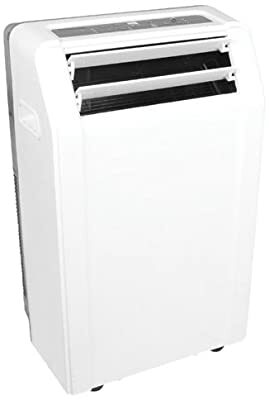 In a common work area, it is advisable for a worker to bring his or her own portable air conditioner to the workplace most especially in the summer when the air conditioner can’t handle the number of people inside and the size of the room and it is more needed when you work alone in an office with no air conditioner. If you are the environmental savvy type and have done a lot of campaign about saving the earth, then trust me a portable air conditioner will be a plus and a boost to your career as it is known for cooling down a room with less energy. Most people staying in a damp and humid area needs a portable air conditioner which can serve as a dehumidifier and appliance that blast cool air. Since most (please note not all) portable air conditioners are also dehumidifiers. To choose the best portable air conditioner, there are factors that must be considered as a matter of fact, some factors are far more important than others. It is still on the basis of what your needs and circumstances are. Now we are going to make things much easier for you on how to choose and what to consider before choosing a portable air conditioner but mostly the specifications and pertinent factors give brief and quick answers but still depends on your needs. The guide above is a just rough estimate. The estimated standard for space assumes the ceiling is 8 feet from the floor and environmental factors like hot environment, rooms with poor insulation and appliances producing heats will need more BTUs. The size and weight can’t be left out as it is quite necessary when choosing the best portable air conditioner since portability could be a crucial issue. If you are the type that likes to move around frequently, then you would have to start thinking about small and light ones. When considering where to place it, there are so many options but placing it close to a window with 18 inches of space for proper ventilation is one of the quickest and easiest ways of installing it. For the sake of your monthly electricity bill and environment, the energy’s efficiency is very important. Here the EER which stands for Energy Efficiency Ratio needs to be checked. The EER helps describe how many BTUs are used for every watt of power. That is, there is more energy efficiency when EER is higher in a portable air conditioner. 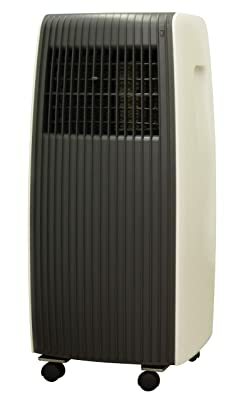 For example, a portable air conditioner with 8,000 BTUs and an Energy Efficiency Rating (EER) of 9 will give 889watts. As for standard air conditioners, an EER of 10 is the lowest or minimum which is impossible for most portable units but any EER close to it, is still good. You should know the best portable air conditioner can be the most energy efficient of them all. It is believed that any machine producing airflow will definitely generate some level of noise. So if you are using a portable air conditioner at work or at home to help you rest better most especially during summer nights, might end up being counterproductive by generating some level of noise. This can be a source of concern and one would need to locate and check the decibel (dB) level. The decibel system can be a bit off for someone without the knowledge scientific and mathematical background. Among all other quieter models on market, has 45dBs has their highest settings. The portable air conditioners almost offer a “set it and forget it” kind of approach maintenance. You will just have to settle with cleaning the filters and probably defrost units with ice buildup. Generally, the only maintenance I would say you would have to do is just draining moisture collected. Portable air conditioners are in various great and they could be small and quite cheaper than the central systems or air conditioners, but without any doubt their rate of delivery and performance are admirable. Here you will get to read and understand why the 10 portable air conditioners are the best. The whynter has quite a large British Thermal Units of 14,000 BTU which makes it very capable of cooling more space than that of the rough estimate which is 500 sq. ft. but when it is placed in a room with no excess moisture, it is capable of cooling spaces a little over700 sq. ft. This unit works in a way that it needs no room air for it to work with the condenser. The dual hose design makes it better than the single hose system because it allows its own air circulation. The Whynter portable air conditioner unit works in a way that saves you the stress of draining the water buckets. It is engineered in a way that it automatically drains water exhausted from the room air and saves you time and manual labor, this technology is also known as an Auto-Evaporation System. The beauty of this unit is how it gives its’ users flexibility via the thermostat and 24 hours remote control. Generally, the BTU has always been used to determine the power of an air conditioner and this unit is from one of the professional cooling appliance company known as Koldfront. This portable air conditioner has a British Thermal Units of 14,000 that is it is meant for rooms that are up to 500sq. ft. in area. It has a feature most portable air conditioners do not have. In this unit, there are three fan modes which mean you as a user can control the breeze however and whenever you like. The koldfront PAC1401W Ultracool works as a dehumidifier as well and can be easily turned off when it’s not needed. The unit also has its own auto- drain system thereby, the won’t be any need for you to start draining water bucket every now and then. This portable air conditioner is a new type of cooling appliance but it has tried its possible best to strife in the market and gain a large number of customers just by its performance. It has a modern feature of a full function remote control which helps you operate the portable air conditioner from a distance and also with a 10,000 British Thermal Units which can cool a room of 400 square feet. 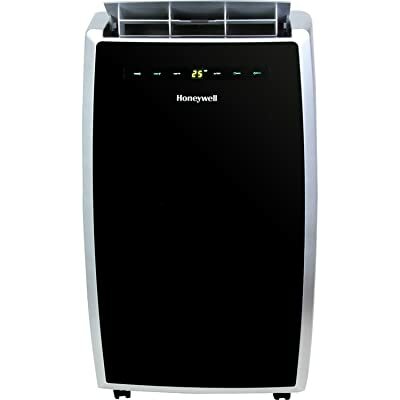 The Honeywell MN10CESWW 10,000 BTU portable air conditioner works as a humidifier and not just as a cooling unit. The unit dehumidifies about 75 pints of water daily in a moist environment, it has a programmable timer, a caster wheel that aids mobility and an auto- drain system that drains water via its evaporation system. 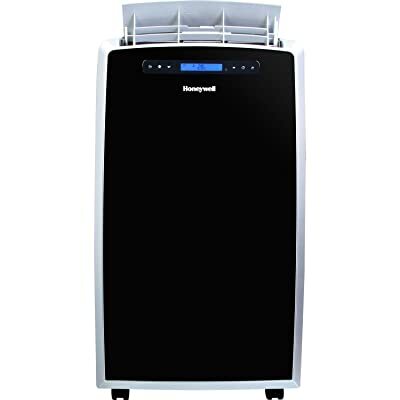 Honeywell MN21CES 12,000 portable air conditioner has a British Thermal Units of 12,000, which can keep an area of 400 to 450 square feet cool and also comes with an auto-drain system that has no bucket or drip. The water produced by it will also be reused by the same machine. The design operates in a kind of recirculating manner. This air conditioner has a multi-use feature that makes it versatile. It works as a dehumidifier, a cooling unit which is the primary objective and also works as a fan with an adjustable mode. Furthermore, the air conditioner comes with caster wheel which eases its mobility and digital control system with a touch screen that allows you to make an accurate adjustment and can likewise be done from a distance with its remote control. This portable air conditioner with 10,000 BTU can keep the temperature of an area that is up to 300sq.ft. cool. 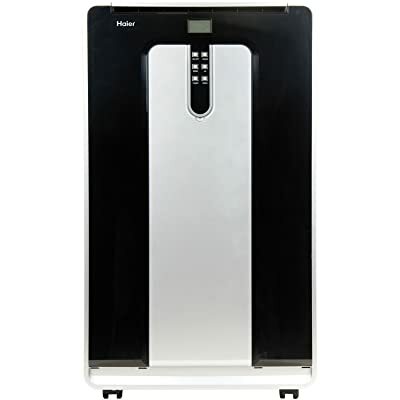 Unlike most portable air conditioners that always need to be sent to the repair department if any problem occurs, this portable air conditioner has a self-diagnostic function that can automatically diagnose itself and guide you to fix the problem. The unit works as an auto-evaporation system that can automatically recycle water exhausted from the room air and then saves you every form of manual labor of draining bucket water. It is noted that there is every possibility that an air conditioner will create ice which can damage the appliance. The unit is designed with an anti-freezing system which prevents the unit from creating ice. The unit is a single hose portable air conditioner with 8,000 British Thermal Units that works best in a space of about 250sq.ft. This portable air conditioner works best in environs with excess moisture. The portable air conditioner has a self-draining system that drains water produced during the cooling process. The SPT works as a dehumidifier while carrying out its cooling activities and it has an extendable exhaust hose which extends to about 59 inches. It has a digital thermostat and programmable time which can also be operated with a remote control. Portable Air Conditioner has an LCD Remote that does just what it’s supposed to. Add to that a very high Energy Efficiency Ratio of 11.2 which means it uses less energy. The 12000 BTU indicates that it can cool down the temperature of an area that is up to 450 square feet and the unit has caster wheels that aid mobility. 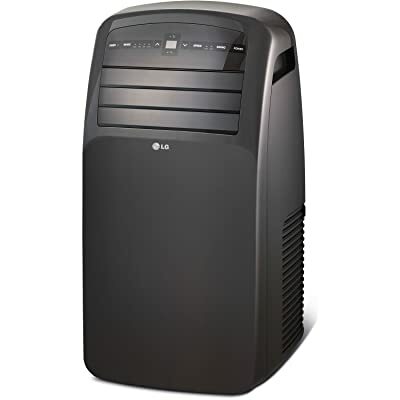 The LG Electronics LP1214GXR 12000 BTU Portable Air Conditioner has a multi-use feature that makes it versatile. It works as a dehumidifier, a cooling unit which is the primary objective and also works as a fan that can be adjusted. The design on the LG Electronics LP1214GXR is nice and user-friendly with 24-hour programmable timer, the full-function remote and auto swing louvers. 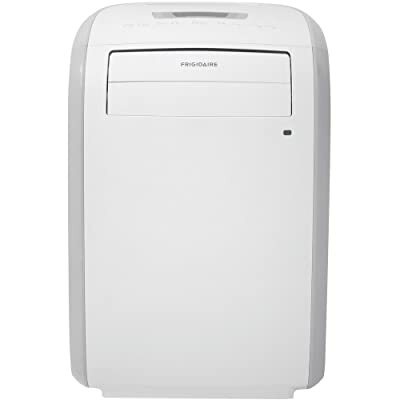 The Frigidaire FRA053PU1 portable air conditioner with 5,000 British Thermal Units that works best in a space of about 216sq.ft. This portable air conditioner works comfortably with an outlet of 115volt. The portable air conditioner has a self-draining system that drains water produced during the cooling process. The unit works as air ionizer which cleanses the air in the room. It has a programmable timer, washable filter, auto-restart, caster wheels and an electronic control. The British Thermal Units has always been used to measure the efficiency of an air conditioner. This portable air conditioner has a British Thermal Units of 14,000 that is it is meant for rooms that are up to 550sq. ft. in area. 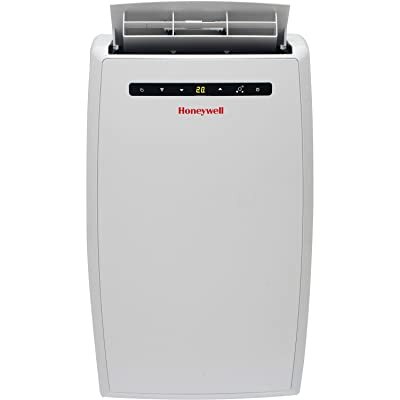 The Honeywell MM14CCS portable air conditioner cools, dehumidifies and circulates air in a 550 square foot room for a sensible price. Its modern look and remote make it a small room charmer with a few caveats. The unit has feather-touch buttons, and they’re backlit so it’s easy to see them in the dark. Don’t worry, that blue backlight turns off after a minute. It is said that the HPN12XCM is still better than most of its peers at making a room comfortable, mostly because it’s a better dehumidifier. It’s rated to pull 4.2 pints of moisture out of the air per hour, which is one of the highest capacities we’ve seen in any portable AC. We also observed a correlation between a higher dehumidification spec and a higher comfort rating in Consumer Reports’s test results. Now, that extra dehumidifying power might matter only in dark or muggy settings, but it doesn’t hurt to have the potential for better performance. The Haier HPN12XCM has a flexible, compressible but very extendable or long hose. The portable air conditioner has a remote control with three fan speeds that can be adjusted without getting out of bed. The drawback it has is that its noise level is high. If you are considering this unit, please expect your electric bill to go up. The portable air conditioner works in a well-designed and structured way that follows a programmed process. A gas called refrigerant is introduced to the portable air conditioner to effect the exchange. The gas easily moves from a low to the high-pressure situation by changing it from gas to liquid and back from liquid to gas. This process makes the air conditioning cooling reaction a success. Low-pressure gas is sent via a compressor whereby the gas can be pressurized rapidly and then converts the relatively cool gas into a heated high pressurized gas. At this point, the hot gas starts passing through the condenser coils which work is to reduce the temperature of the gas and turns it into liquid form. The liquid goes into the evaporator coils and drops pressure rapidly. ( the cooled gas goes back into the compressor to start the process all over again) Hot air from the house is brought in past the evaporator coil and it is cooled for the blower to now push it back to the room. If there is no wall vent existing, use a jigsaw to cut a 4-inch-diameter hole through an exterior wall. At the rear flange on wall vent, apply silicone caulk. From outside, slide wall vent through a hole in the wall; secure with stainless steel screws. Twist and lock the flexible duct to the exhaust port on the rear of air conditioner unit. Connect the duct end to the wall vent and seal with foil duct tape. Plug air conditioner unit into an electrical outlet. Turn on the unit, then set the thermostat and, if desired, the automatic timer. Which one would be the best to choose? Is obviously what’s going on in your mind right now. The truth is there is no right answer that will definitely satisfy everyone’s needs. The use of portable air conditioners for different needs, a different type of people with a different definition of comfortable temperature and most especially different people with different account balance. You just make sure you read this article comprehensively and I promise you that you will be able to set your priority right and choosing what is right for you will be done in no time.